Both of the big cruise lines sailing from Baltimore offer cruises over Christmas, and a small ship line does too. Take a cruise south and celebrate the holiday on a warm beach. A Christmas cruise is a good way to gather your entire family. Everyone can relax and enjoy themselves, because the crew handles all the cooking and clean-up. The ships decorate for the season and offer special activities and parties for passengers. 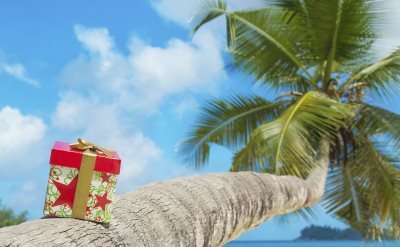 Royal Caribbean offers an 8-night Bahamas & Southeast Coast Christmas cruise in 2019. The round-trip cruise departs from Baltimore on December 20. Stops include Port Canaveral (Florida), Nassau (Bahamas), CocoCay (Bahamas) and Key West (Florida). On Christmas day the ship is scheduled to be at Key West. Carnival Cruise Line has a 7-night Christmas cruise to the Bahamas from Baltimore. It goes to Nassau (Bahamas), Princess Cays (Bahamas) and Freeport (Bahamas). Depart December 22, 2019. The ship is scheduled to be at Nassau on Christmas Day. On Carnival cruise ships the atrium and promenade areas are lavishly decorated for Christmas. Sing along to classic tunes. Compete in the ugly sweater contest. Santa Claus arrives to bring joy to the kids on board and the Grinch makes appearances throughout the cruise. See a spectacular Christmas show in the main show lounge. Christmas dinner features traditional roasted turkey. American Cruise Line offers a 10-night Colonial Christmas cruise. It is round-trip from Baltimore to Norfolk (Virginia), Williamsburg (Virginia), Yorktown (Virginia), Washington (DC), Mount Vernon (Virginia), Cambridge (Maryland), St Michaels (Maryland) and Annapolis (Maryland). Depart December 23, 2019. On the new American Constitution ship you'll enjoy a festive cruise over Christmas and New Year's. There will be holiday music, caroling, cookies, gift exchange, New Year's Eve gala, and holiday-inspired excursions. You may also want to consider Christmas cruises from New York. That port offers several choices that are different from those out of Baltimore.